(Text automatically translated) Studio located very close to the city center in a quiet area surrounded by pine trees and overlooking the sea. 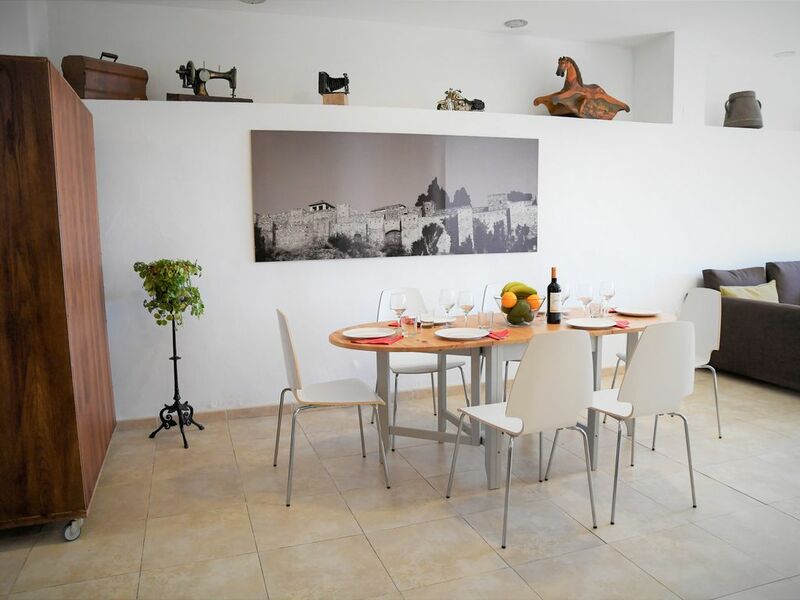 A 200 meters from Castillo de Gibralfaro and 1 km from the beach and 1.2 km from the Picasso Museum and WIFI ciudad. FREE Internet WIFI. Easy and free parking in front of the house. For more than 6 people we have another apartment. Both apartment can be join. I had a really good time staying here, even if at the last minute Alvaro moved me to another place (which was a really nice place, I migh add, and at the same cost . . . so there was no bait & switch). Highly recommended. The one caveat is that it is up a long hill from El Centro, so if you don't like walking this might not be ideal for you. I enjoyed the walks though. And it's quieter up in the neighborhood than El Centro. "A fabulous peaceful place for stay if you wish to stay close to the centre but at the same time not to be bothered by the vibrant nightlife of the centre. Located on the hill close to the major place of interest in Malaga - Castillo de Gibralfaro, it is a perfect place to have a stunning view of the city and of the sea shore. Another strong feature is that there is always a place to park your car free of charge. The apartment was neat and tidy, quite spacious for us two and ecquipped with all necessary things, including the notebook with free internet. The owner was very helpful and always ready to advise paces of interest, places to eat out and give advice when we collided with some unknown situations. "We stayed in this apartment in September 2011. The apartment is very nice and full equiped. It is located a quiet area near to Gibralfaro Castle. The aparment is between 15-20 mins by walk into historic center (with great views of the city). "We had a very nice time in Malaga. The apartment is very nice, clean and well located, only 10 min. walk from the castel of Gibralfaro. The leaser is very nice and he gave us some maps and informations about the city." "I rented the apartment for like about 1month and a half, everything was just perfect, the apartment was equipped with everything needed and very clean. It`s very close to a bus station and it`s close to the city center as well. He was very helpful he always let me know about upcoming events and events from other cities as well. I will gladly get back to this apartment on my next holiday, strongly recommended. My sincere thanks to the owner." "We had a wonderful time in Malaga and really enjoyed our stay. The apartment is set in a lovely location. It's a quiet residential area and the apartment is clean, with everything you need. The owners are lovely people and provided the personal touch to make our stay in Malaga something we want to repeat! We especially enjoyed the homemade tortilla." (Text automatically translated) From the Airport: Take the motorway towards Motril and take the exit 244 direction Limonar / Paseo Sancha and follow signs to the Castle of Gibralfaro.